This is probably the first post on (hopefully) a series of ‘offtopic’ posts covering cool things I’ve done and consider worth sharing. It’s about a side project we did more than two years ago, while working on multitouch tables and IR technology. At first we incorporated a 780 nm infrared laser into a plastic MP5 soft-air toy gun. The laser perfectly fit into the barrel (Fig. 1a). Two 1.5 V batteries were placed inside the hold (Fig. 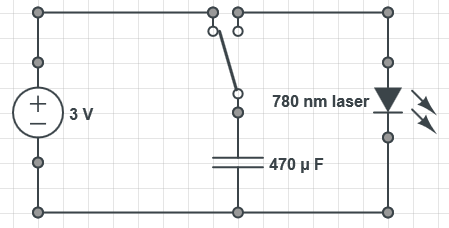 1b) and wired with a 25 V/470 µF, a switch and the laser (Fig. 2). Figure 1 – Inside of the modified MP5 softair, there’re battery pack (b), 470 µF capacitor and some mechanic to trigger the switch. The 780 nm laser (a) perfectly fits into the barrel. Figure 2 – The circuit diagram for a pulsed laser. The idea behind using a capacitor is to prevent continuous firing of the laser, most importantly as a security measure. 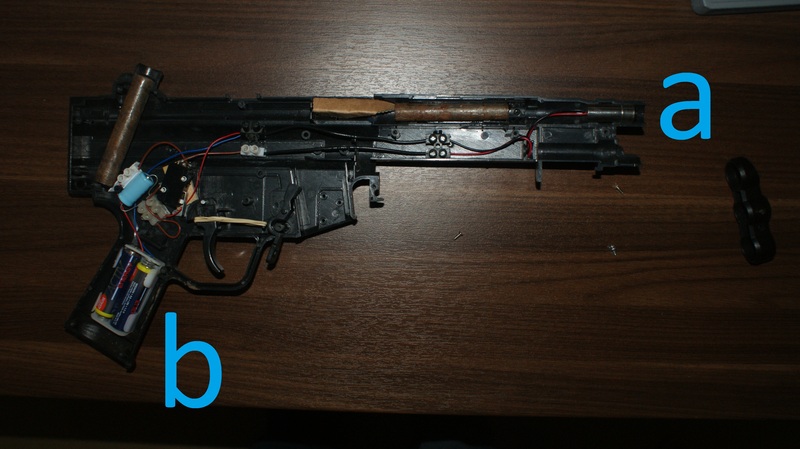 The assembled MP5 laser gun can then be used to fire light bursts of a few milliseconds. To track the infrared light spots on a projection surface, we used a modified Hercules Classic Silver webcam. It’s a very cheap model (only 320×240 pixels) but it features a M12 lens with integrated IR filter which can easily replaced by a custom M12 lens with a bandpass filter, transparent for infrared light. Another reason we used the Hercules Classic Silver is that my grandpa had it laying around. After calibration of the projection screen dimensions in CCV (using a single IR LED, or another (infrared) light source) we were able to shoot mouse clicks onto the screen with the laser MP5. Hi, this is an awesome project, I have been looking for something like this and this is kinda what i was looking for. I need a system like this one in my school, its a military school but this year real weapons in military schools have been forbidden in my country, but we still need to learn some accuracy stuff. Could you help me please sending me some extra info or something that could help me with this project. Sorry im not very good at english. At first this is not the kind of setup which can achieve actual accuracy and I’d also like to point out that I don’t want to encourage the use of force to enforce an argument. This setup is solely to be used as a game. Could you ask a more precise question? As I see it, all that is required to recreate the setup is available.